RARE EARTH: Two Comps For Motown’s Blue-Eyed Soul Brothers – Schlockmania! Motown tried hard to make inroads into the rock and roll audience in the early 1970’s. 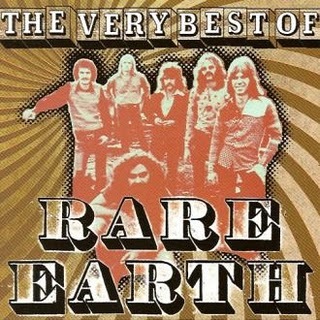 Most of these efforts fell by the wayside but one band managed to carve out a career and a few notable hits: Rare Earth. This Detroit-based bar band was nearly all-honky in its lineup but they brought a lot of funk to their rocked-up version of blue-eyed soul. You one can hear in their classic recordings: lead singer/drummer Pete Rivera (nee Hoorelbeke) could belt it out with the deep-voiced grit of Motown’s more gospel-influenced singers while the rest of the band filtered the their Detroit soul influences through hard rock and Santana-esque big-band jamming to create a down-to-earth soul/rock fusion tailor-made for the 1970’s arena crowd. Rare Earth quickly became a big concert attraction and recorded extensively but never got the career-development attention or critical favor that their Motown peers did. They also tended to be rushed through the album-making process and suffered from frequent shifts in lineup. As a result, their albums tend to patchy and are seldom in print. Thankfully, Rare Earth had enough chart hits to make it worthwhile for Motown to anthologize their work several times over the years. The two collections discussed here offer aspiring schlock-funkateers a nice way to sample the choice moments of the group’s catalog. Their tendency to stretch out in L.P. form is curtailed here, with sidelong epics like “Ma” and the aforementioned “Get Ready” trimmed down to their svelte, single-edit versions. However, this choice gives the compilers the chance to work in more lesser-known singles, like an intensely funky reading of the forgotten Temptations single “Hum Along And Dance” that is rebuilt around a relentless bassline and “Hey Big Brother,” a conga-accented funk-rock treatise on “the Man’s” indifference to the plight of the inner city. All in all, The Very Best Of lives up to the promise of its title and offers a good summation of their recording career. Earth Tones is primarily a release for those already converted to the Rare Earth fold. A number of the tracks from The Very Best Of reappear here – however, all but one appear in substantially different versions. The main focus here is letting the group stretch out in the FM-radio style that the old-school fans are accustomed to. The disc is anchored by three epics that highlight their tension-and-release approach to blending rock with funk – monster versions of their hits “(I Know) I’m Losing You” (10 minutes) and “Get Ready” (20 minutes!) plus a 12 minute-plus group original called “I Couldn’t Believe What Happened Last Night.” All three are more listenable than you might expect, with a precision to their arrangements that shows off the band’s chops. Earth Tones also gets bonus points for including the 12-inch mix of the fun, Bee Gees-penned-and-assisted disco crossover tune “Warm Ride” However, the unexpected surprise is “Dreamer,” a surprisingly good ballad from their oft-negligible late 70’s output that boasts an addictive melody and a believably world-weary vocal from Hoorelbeke. Both discs are out-of-print and require a bit of hunting but each is worthy of exploration for anyone who appreciates the anything-goes, genre-bending ethos of early 1970’s rock and soul.